Sugar we're going down shopping. 1. 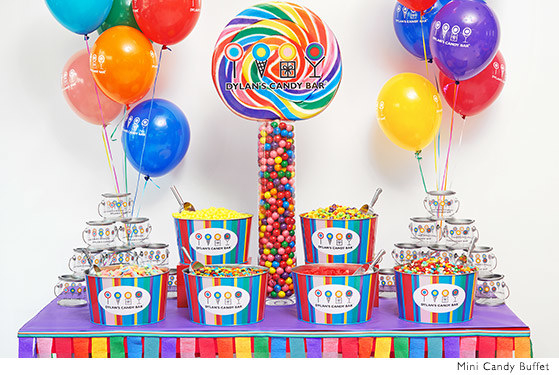 Dylan's Candy Bar is Willy Wonka's chocolate factory IRL. They have such a variety of candy and chocolate to choose from you'll walk away thinking you got the golden ticket after all. Why they're cool: They'll help you throw ~super sweet~ parties of all kinds like bridal and baby showers, corporate events, and birthdays. You name it, and they'll have candy for it! Check out their parties page here. Shipping: Free shipping with orders over $75. 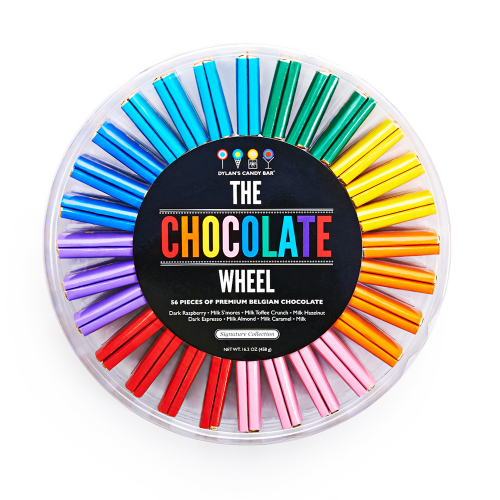 Get the signature chocolate wheel (pictured on the right) for $33.75. Shop all their chocolate here! 2. Postsweet is a subscription box that brings chocolate and treats from around the world right to your doorstep every month. Why they're cool: Each basket is filled with a different country's beloved sweets! Shipping: Shipping included in the price. Only available within the United States. Get a monthly subscription to Postsweet on CrateJoy for $29.99+/month. 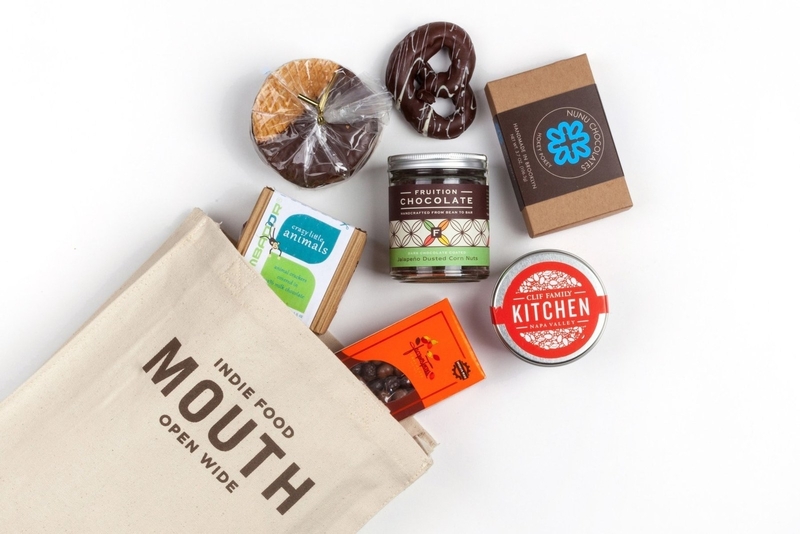 Shop all the chocolate subscription boxes available on CrateJoy here! 3. 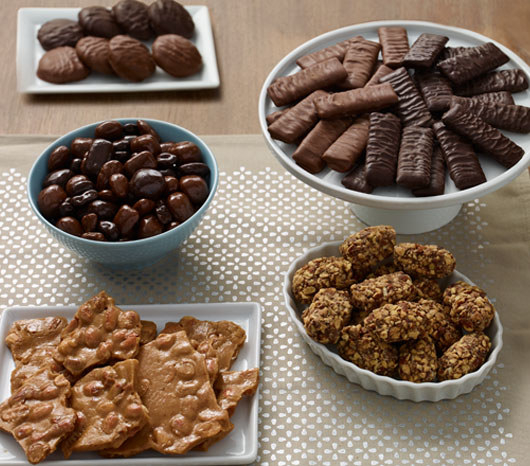 See's Candies offers delicious chocolate treats for any occasion. Right now they have a great spread of game day snacks! GO SPORTS BALL! My favorite kind of Super Bowl is one filled with chocolate. Why they're cool: They've been making chocolate since their first store opened in California in 1921, almost 100 years ago (omg)! They also offer over 100 varieties of chocolate for all different occasions like Valentine's Day, game day, gift boxes, and custom mixes! To top it off they offer a variety of yummy lollypops everyone (including me) is obsessed with! Shipping: Free for any order over $60. 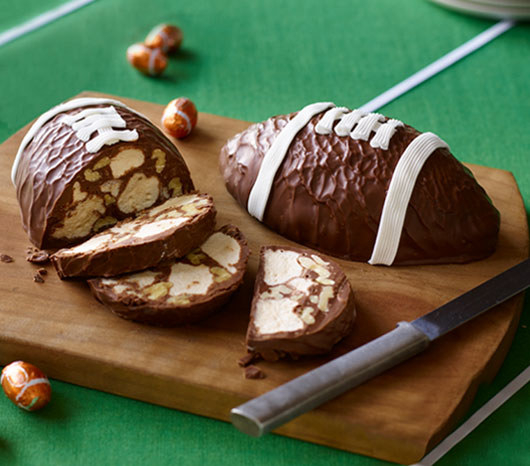 Get the Rocky Road Football (pictured on the right) for $13.90. Shop all their chocolates here! 4. Godiva, a staple chocolatier since 1926, is still bringing us decadent treats for the people we love most. 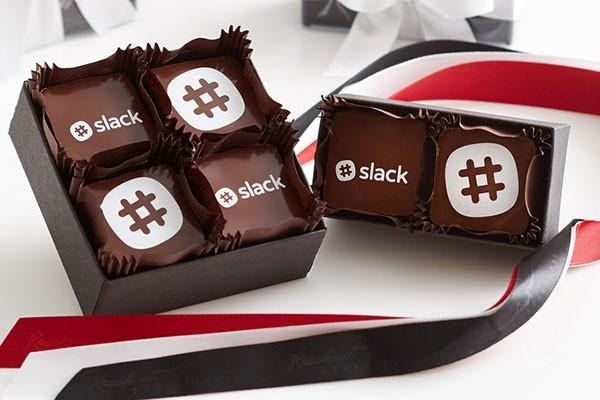 Why they're cool: It's a brand we have come to know and love so when that box shows up at your door you know just what to expect — a mouthful of chocolatey goodness every time! Shipping: Standard shipping starts at $7.95. Get the Gold Discovery Collection pictured here for $25. Shop their full selection here! 5. Mouth, yes, has an entire selection of chocolate and chocolate-themed gift boxes, but I'm here to tell you they also offer CHOCOLATE. FLAVORED. WHISKEY. GOODBYE. It's gonna be a wild night and we'll ~choc~ it up to the most delicious poor decision of our lives. Why they're cool: Have a tight budget? Want something vegan? Not to worry! They'll let you curate gift boxes based on personal taste preferences, dietary restrictions, and how much you want to spend! Shipping: Standard shipping starts at $11.99. 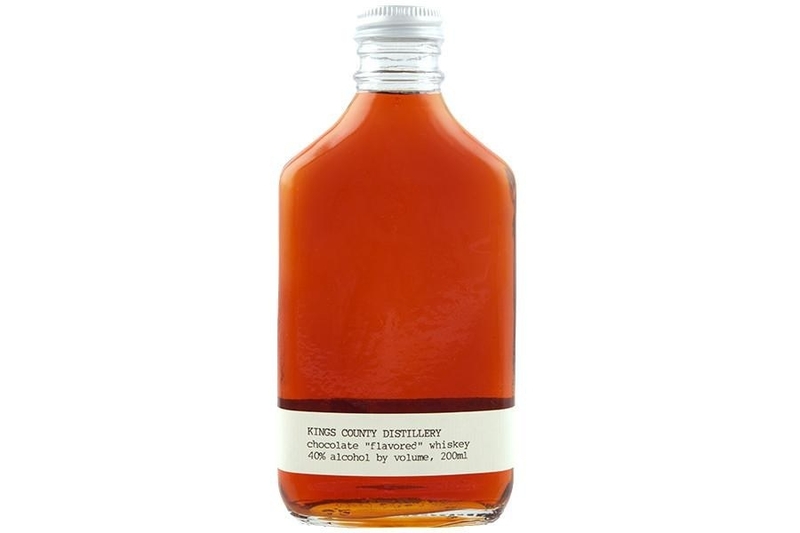 Get a flask of Chocolate Whiskey (pictured on the left) for $26. Shop all their chocolate options here! 6. 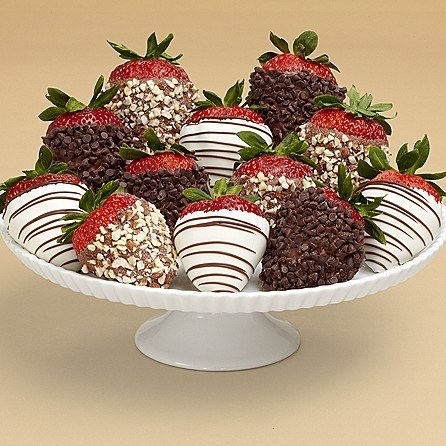 Shari's Berries sells (you guessed it) chocolate-covered strawberries! But that's not all, they also have an assortment of truffles that have secret messages underneath them. Who doesn't love a fun reveal? Chocolate and strawberries. Name a more iconic duo, I'll wait. 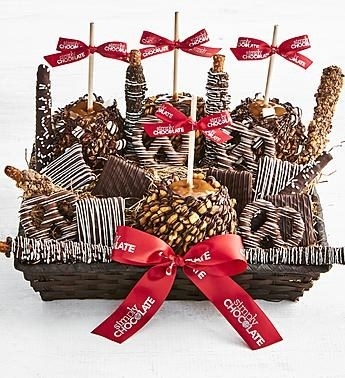 Why they're cool: They have everything from deluxe baskets for a super special birthday treat to something more refined to gift someone in the office. Shipping: Standard delivery starts at $9.99. 7. Harry and David offers a wide variety of treats from more traditional options like their chocolate truffles to ones more ~out of the box~, like this treasure chest of treats! Behold, an actual treasure chest. Let the mahogany-stained wood pull you in to reveal the chocolate cake, truffles, s'mores bar, and malt balls awaiting you! I don't know about you, but this sure is shivering my timbers. Why they're cool: Among their vast selection is a variety of chocolate, nut, and marshmallow popcorns called Moose Munch, which is just a hilarious name so I felt I should mention it! 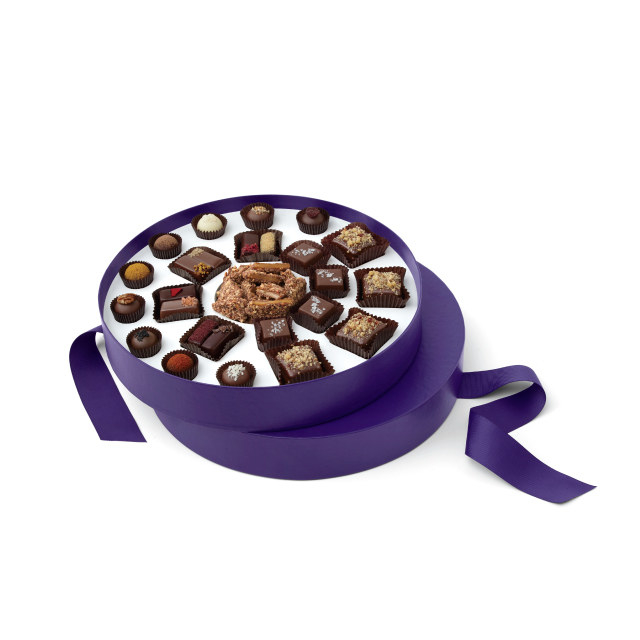 Get the Chocolate Treasure Box pictured here for $49.99. 8. Vosges Haut Chocolat is known for drool-worthy hot chocolate as well as an assortment of elegant chocolate gift boxes fit for a QUEEN. Why they're cool: Vosges Haut Chocolat is female founded by the incredible chocolatier Katrina Markoff. She ethically sources her ingredients and has worked all over the world in order to bring you something the likes of which you've never tasted before. Shipping: Standard shipping starts at $12.95 and is free on orders of $251+. Get the drinking chocolate for $15, and the gift set for $80. 9. 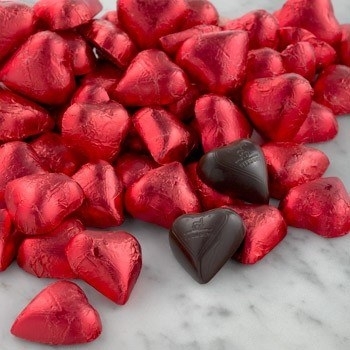 Lake Champlain Chocolates delivers heaps of Valentine hearts and chocolate bars, and guess what — they're both VEGAN! Why they're cool: Not everything on their menu is vegan, but It's really cool that they offer that for those who desire it! Another cool thing is their chocolate of the month club, which you can subscribe to for three, six, or nine months! YUM. 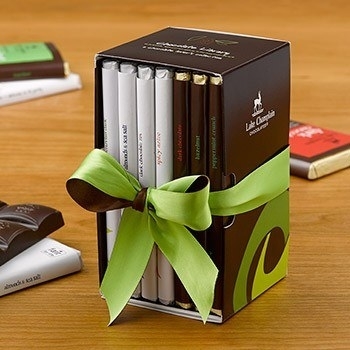 Get the pack of 155 chocolate hearts for $80 and the Dark Chocolate Bar Library for $35. Shop all their vegan chocolates here! 10. 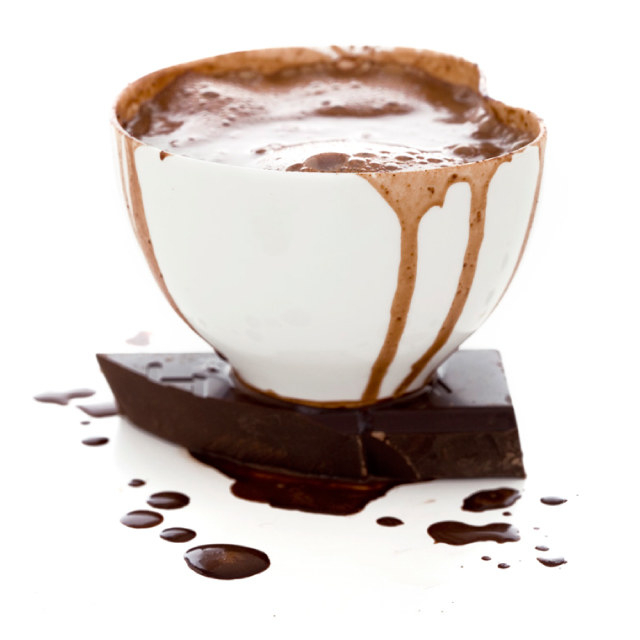 Recchiuti has (IMHO) the most photogenic hot chocolate plus customized chocolate options for both company and personal gifts! 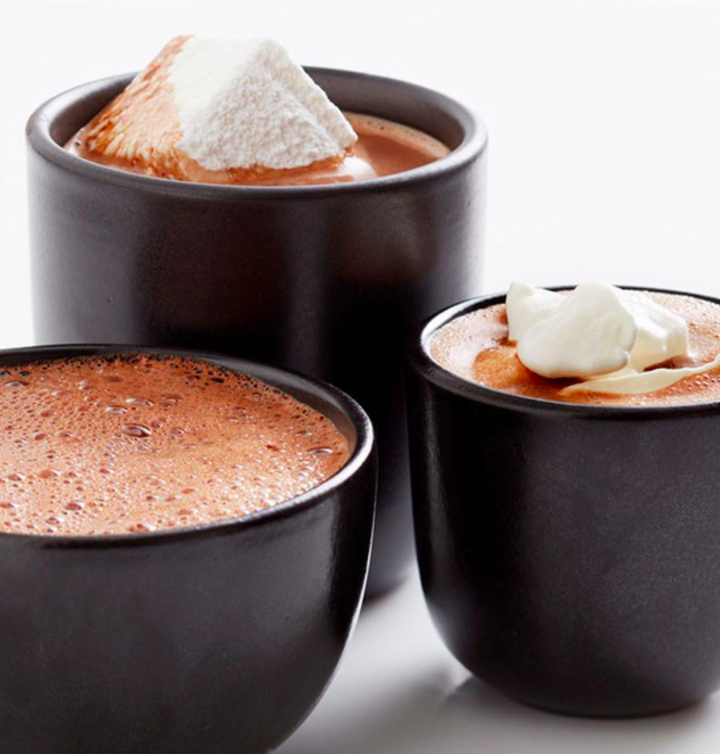 Why they're cool: They source the cacao in their hot chocolate from South America and its rich flavor is sure to fulfill your coziest wintertime fantasies. Shipping: Two-day shipping costs $15. Get the dark hot chocolate for $19 and find out more about business and personal customization options here! 11. 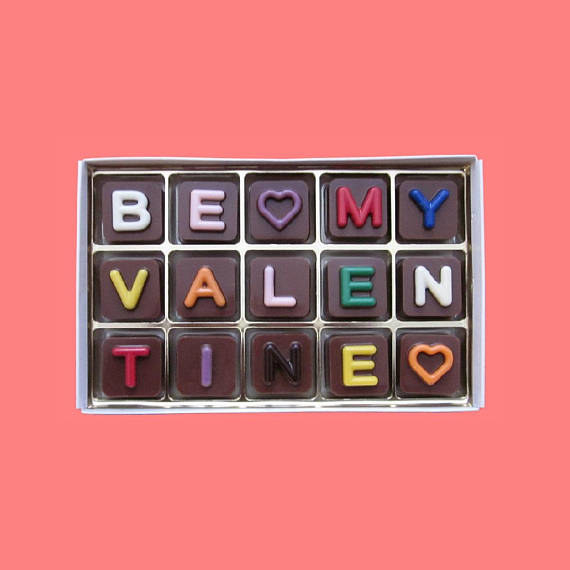 MarieBelle is a NY-based chocolate shop that delivers a romantic assortment of chocolate ganache with nostalgic designs on each bite. Why they're cool: It's art you can eat! You also get 10% your first order if you sign up here! 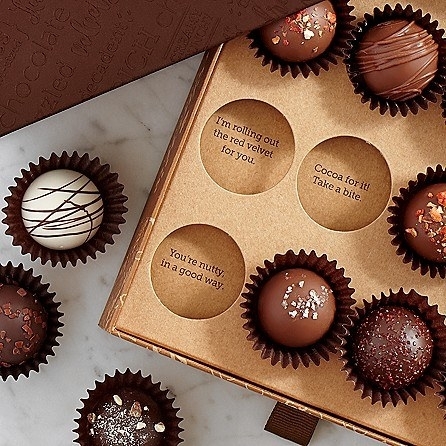 Get the 10 piece chocolate ganache box for $16. Why they're cool: It's great to support a small business, plus customized anything is always cool! Mine would read: "All mine, do not touch." Shipping: $5.25 on all orders. 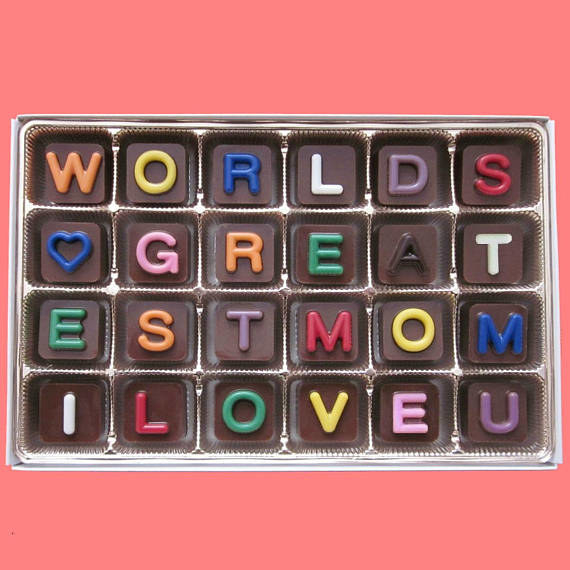 Get a customized box from What Candy Says on Etsy for $30.99. 13. Amazon offers, among millions of other incredible things, BULK. CHOCOLATE. and at a really great price! Why they're cool: Look, normally these guys cost like a $1 each at the check out counter and I always want to grab the whole box but I can't spend $60 on a last minute craving. Have you had this happen to you? Well look no further because once again Amazon is the answer to our problem. 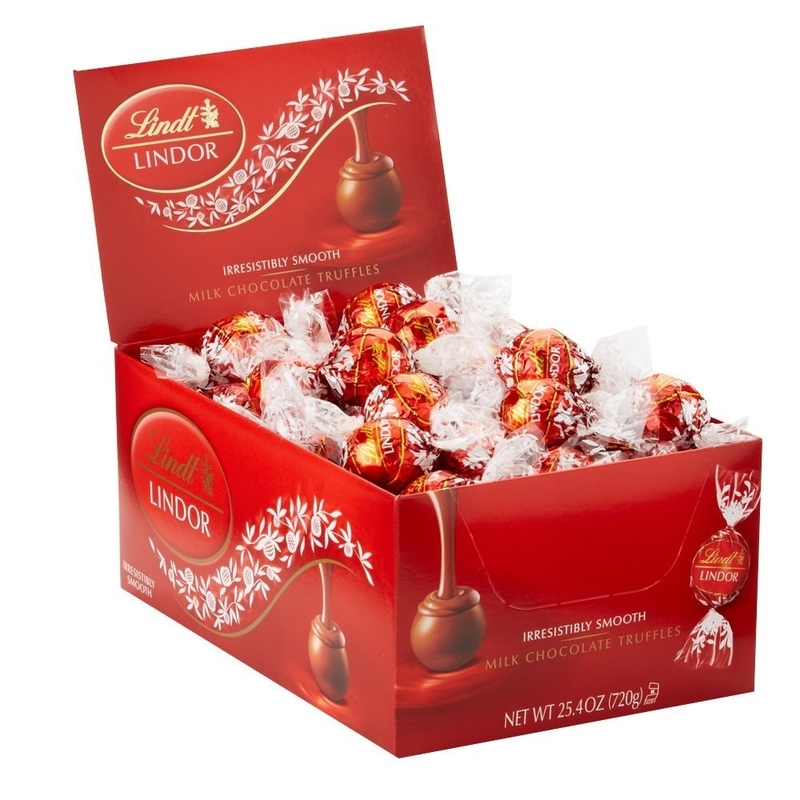 This box of 60 Lindt's melt in your mouth truffles will only cost you 20 cents a pop! You're welcome. Shipping: Free one day shipping with Prime. 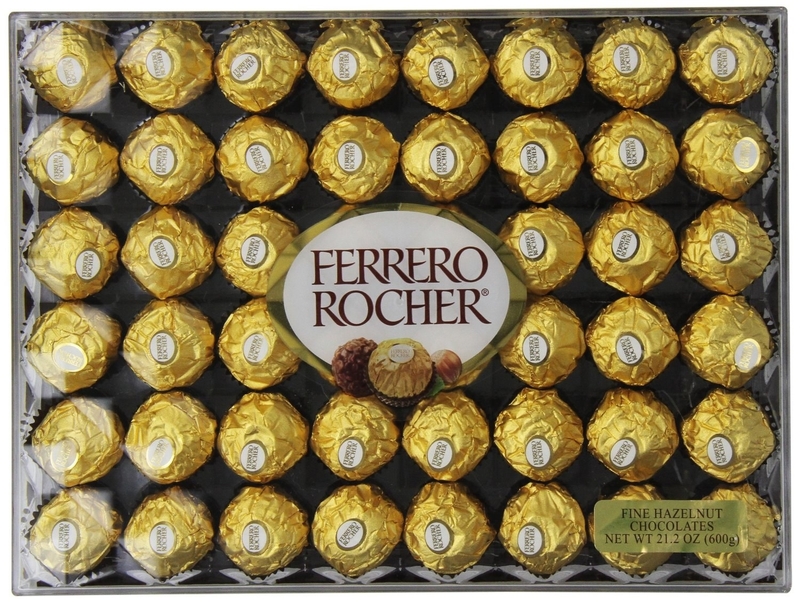 Get 60 Lindt truffles from Amazon for $12.93, and the 48-count Ferrero Rocher gift box from Amazon for $12.49. 14. 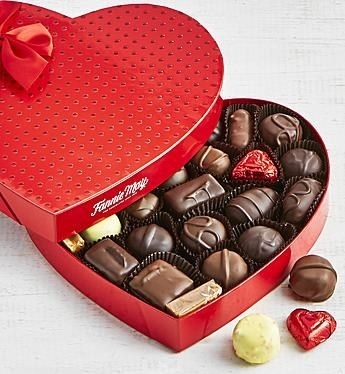 Simply Chocolate is the perfect place to shop if you're looking for a stand-out chocolate basket or more traditional Valentine's day chocolate boxes. Why they're cool: They carry all sorts of brands like Max Brenner, Ghirardelli Chocolates, Fannie May and many more so you don't have to look far to find what you're looking for! Get the Deluxe Snack Basket for $69.99 and the Chocolate Heart Box for $29.99. 15. Taste Trunk is great option if you love chocolate but also like to mix your chocolate with other treats as well, like popcorn, cookies, nuts, and caramels! Why they're cool: They have a box they call "Death By Chocolate" and I really shouldn't have to say much else. Shipping: Costs depend on the order. Get the Death By Chocolate box for $49.99. 16. From You Flowers doesn't just deliver flowers! They ship baskets of yummy chocolate too! I'm honestly so ~bitter~ I didn't know about this sooner. 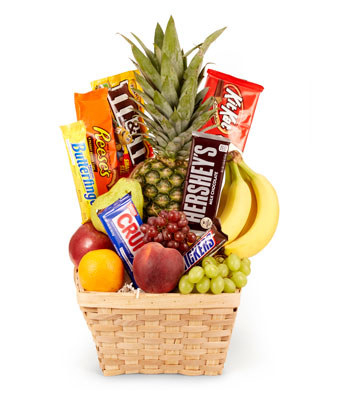 Lmao at the fruit in that second basket, like thank you for the pineapple but we all know why we're really here. Why they're cool: Ok I know I made fun of the pineapple BUT fruit is actually really great with chocolate and it's cool they offer that variety! 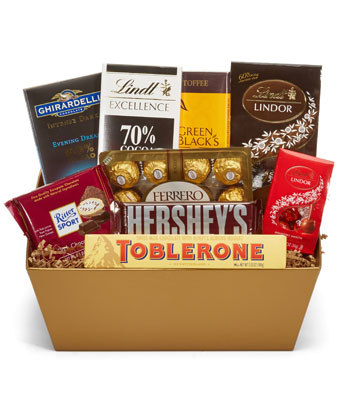 Chocolate gift baskets start at $31.99. Live footage of me living my best life.